Ecuador is an incredible country to visit and which month you choose will mostly depend on when you are free to travel. Ecuador is found in the world’s tropics and the country’s name itself is Spanish for ‘equator’. This means there is a pleasant temperature throughout the year and the most significant temperature difference is between day and night instead of between months. There are many fantastic tourist attractions and popular regions to visit in Ecuador, including the famed Galapagos Islands, the Cloud Forest, the Andes, fascinating cities, beautiful beaches, and the incredible Amazon River & Rainforest. Although a fantastic place to visit at all times of year, there are a few differences for the different regions. In this article, we will give an introduction to Ecuador and the different regions and attractions then mention the best time to visit each of these fantastic destinations. After this, we will provide our recommended tours to experience this incredible country. For many visitors to Ecuador, natural attractions are the main draw, such as the wildlife and scenery. However, the country’s history and culture is also part of the appeal. 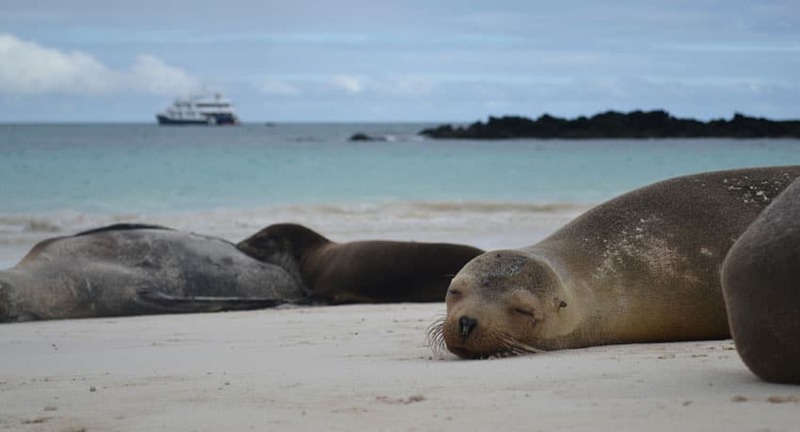 The Galapagos Islands are Ecuador’s best known natural attraction. Found 550 miles (900 km) from Ecuador’s coast, the Galapagos were once known as the Enchanted Isles. Brought to fame by Charles Darwin and our understanding of evolution, the Galapagos Islands are a haven for wildlife. Enjoy giant tortoises that wander up and down the volcanoes, marine iguanas basking on the rocks, blue-footed boobies making their nests and much more. The marine environment then offers a diversity of colorful fish and sightings of hammerheads and manta rays. The stunning scenery and natural features are worth the visit on their own. You will be treated to beautiful beaches of white coral, green crystals and black volcanic sands. The Galapagos Islands are known to experience two distinct times of year. Between December and June, you can expect a temperature between 80ºF (27ºC) and 90ºF (32ºC). This warm temperature is accompanied by a little more rain. June to November is then drier and offers a slightly cooler temperature of between 70ºF (21ºC) to 80ºF (27ºC). Most of the wildlife stays around the islands and doesn’t migrate. However, a few animals, such as manta rays, hammerheads and some birds leave and return to the islands depending on time of year. The warmer and wetter part of the year (between December and June) is due to the El Nino Current. This also brings nutrient-rich water and food, which attracts visiting manta rays, hammerheads and other wildlife. There are 21 islands in total and many can be visited on guided tours. Each of the islands offers something new to discover, including different animals and plants, hidden beaches, fascinating history and beautiful views. There are some fantastic things to do on the Galapagos Islands and the best suggestions is to book a Galapagos Cruise or package tour. A fantastic luxury cruise for the Galapagos Islands, the Ocean Spray offers more comfort and stability than many other vessels. The catamaran cruise style and spacious suites ensure a very comfortable experience. Enjoy large, comfortable beds, modern ensuites, clean and comfortable living areas, the jacuzzi, sundeck, and private balconies. The Ocean Spray offers a variety of itineraries from 4-days to their 15-day mega cruise for in depth island exploration. The vessel is also equipped with kayaking and snorkeling equipment for guided tours exploring the marine environment. The Petrel Galapagos Cruise offers a luxury-class catamaran built for performance and stability as you cruise between islands. The Petrel offers large, comfortable relaxation area, spacious suites, and a jacuzzi. Your suites then offer a private balcony and modern ensuite. On expeditions, you will be accompanied by a professional naturalist guide on trail walks, kayaking, and snorkeling tours. Enjoy guided tours from the main vessel to explore incredible wildlife, including blue-footed boobies, iguanas, giant tortoises, whales and more. The Red Mangrove Hotel offers a luxury experience of the Galapagos Islands. Enjoy comfortable suites, an inhouse restaurants ranking as one of the best on the islands, and even iconic wildlife at your doorstep. Positioned next door to the Charles Darwin Research Center, which is a favorite attractions of the islands, enjoy exploring the center to learn the work the Charles Darwin Foundation is doing to help protect the Galapagos. See the giant tortoise breeding program, including baby tortoises, and other Galapagos wildlife for a glimpse of what you will find around the Galapagos. You will also be nearby excellent restaurants, cafes and galleries. You can see resident sea lions of the hotel, which come to relax of a day on the property. There is a specific area at the hotel for the sea lions with access to the ocean. You will also see marine iguanas relaxing on the deck and you can even see frigatebirds and pelicans nearby. The Red Mangrove Hotel offers package tours to enjoy the Galapagos. After enjoying a delicious breakfast on the deck overlooking the coast, explore the different islands to see fantastic wildlife, beautiful scenery, and fascinating bays and beaches. Ecuador is a fantastic place to experience the Amazon Rainforest. Enjoy recommended lodges and river cruises to explore Ecuador’s Yasuni National Park and surrounding rainforest. Ecuador’s section of rainforest is consistently found to be the most wildlife-rich area of Amazonia. You can see incredible wildlife on guided tours. See colorful toucans and parrots, several different monkeys, pink river dolphins, caiman crocodilians, and beautiful butterflies. To visit Ecuador’s Amazon Rainforest, you will fly to El Coca, which is your rainforest gateway. 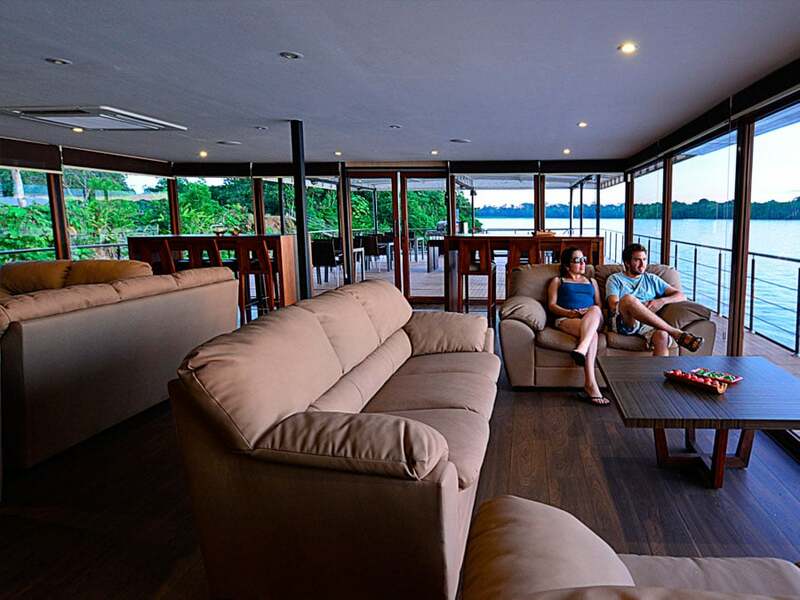 From here, you will travel down the Napo River deep into Amazonia before arrival at your rainforest lodge. 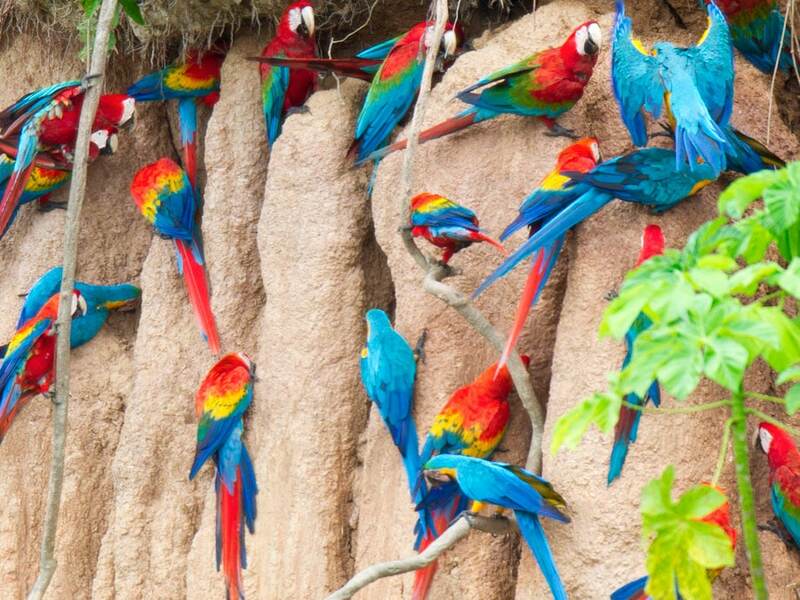 A rarity for the northern Amazon, you will visit a parrot claylick to see hundreds of colorful parrots gathered at the clay. 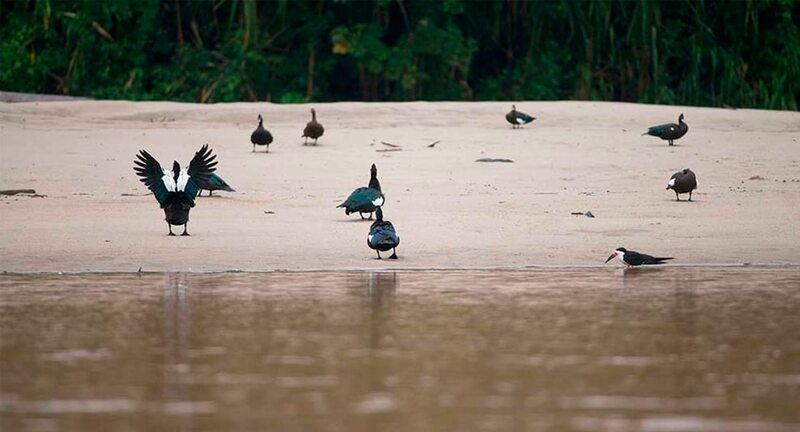 You will visit the Yasuni Claylick by boat to watch the colorful birds. The birds feed on the clay, which helps detoxify fruits and seeds they have eaten in the forest. The best time to visit Ecuador’s Amazon Rainforest is again determined by when you are available to travel. There are two main seasons, which are the wet and dry season. However, even over the wet season the rain often falls towards late afternoon and evening then clears by the following morning. The wettest months are often April and May. As this is a rainforest, the rain can still fall over the dry season. The main difference is the intensity and frequency of rain. But note that the difference is relatively subtle. It should also be noted that the wet season is also a great time for wildlife, as the forest fruits and flowers over the wetter months. This means you can see several monkeys and different birds feeding from abundant forest fruits. The dry season from July to November is also a great time to travel with abundant wildlife enjoying drier weather. As there is less rain, wildlife is thought to concentrate around fewer bodies of groundwater. You can also spot animals harder to find over wetter months, such has caiman and different birds. The temperature in Ecuador’s Amazon stays around 82°F (28°C) as a daily average. However, note that temperature of a night is cooler. Nightly temperature often drops to around 73°F (23°C). 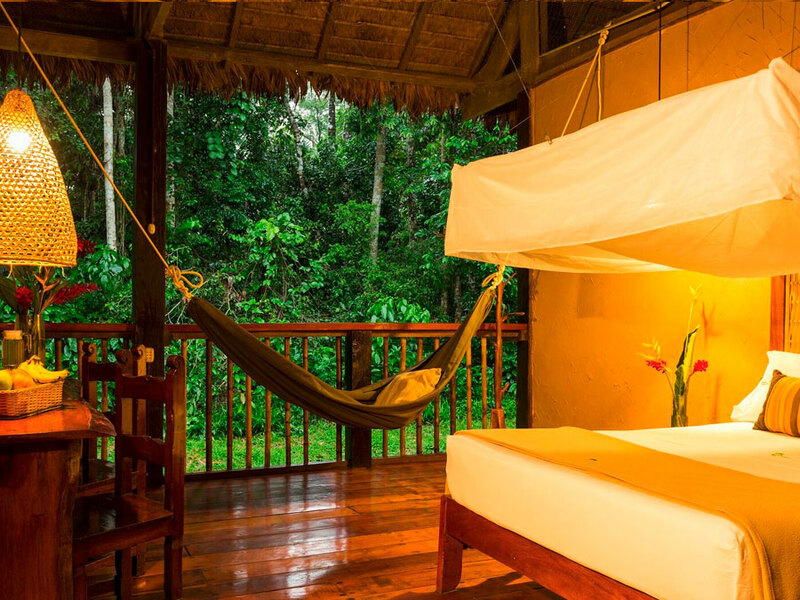 There are some fantastic rainforest lodges to enjoy Ecuador’s Amazon Rainforest. The Napo Wildlife Center is a community-owned lodge positioned inside Yasuni National Park. The Napo Wildlife Center offers a luxury-class lodge owned and managed by the Kichwa Añangu community. Enjoy being guided around the rainforest by members of the community to see a diversity of animals and plants. Because the lodge is positioned inside the Yasuni National Park, there is a lot of wildlife to find. Enjoy guided tours to see howler monkeys, squirrel monkeys, capuchins, tamarins, and titi monkeys. You will also see many colorful birds, such as toucans, parrots, macaws, cotingas and tanagers. The lodge itself is composed of a large building as the main hall, which is also where you can find the library with nature books. This is also where you find the Napo Wildlife Center restaurant and bar, which features panoramic views of the surrounding rainforest. The canopy tower is also accessed from this main building. This is where you can visit to look over the rainforest canopy to spot toucans and parrots flying over the trees. Your suite at the Napo Wildlife Center then offers large, comfortable beds and 24/7 electricity provided by solar panels. Your suite also comes with ceiling fans, a balcony for fantastic views and a private bathroom with hot water. From Napo Wildlife Center, enjoy guided walks on rainforest trails and canoe Añangucocha lagoon to spot lake-living wildlife. La Selva Lodge & Spa offers luxury-class rainforest accommodation near the incredible Yasuni National Park. Enjoy expertly guided tours through the rainforest so see several different monkeys, colorful birds, fascinating reptiles and more. You will also visit the canopy tower to observe colorful birds and enjoy beautiful scenery. La Selva offers comfortable suites and delicious cuisine. The lodge is also Rainforest Alliance certified. The trails around La Selva Lodge have been carefully chosen to show giant trees, the best areas for wildlife, and the beautiful lake. In addition to the trails, enjoy canoeing the waterways and visiting the Yasuni Claylick to watch colorful parrots. Your suite at La Selva Lodge offers comfortable king-sized beds, private bathrooms and balconies, high-quality linen, and rainforest showers. The lodge also offers a spa where you can enjoy a massage or relaxation treatment after rainforest exploration listening to the sounds of Amazonia. 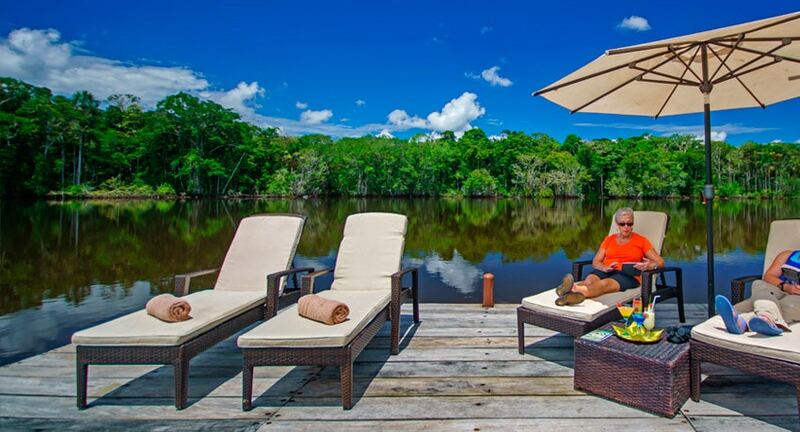 The Sacha Lodge offers a comfortable lodge to experience Ecuador’s Amazon Rainforest. Nestled within a private reserve, the wildlife has grown accustomed to the lodge and visitors. It’s not unusual to see tamarins playing on the boardwalks, monkeys crossing through the trees above your accommodation, or see wildlife underneath the walkway. The lodge sits at the edge of a rainforest lake, which you will explore in canoe to find lake-living wildlife. The Sacha Lodge also offers a giant canopy walkway, which is a great place for birdwatching and observing the rainforest canopy. The walkway extends 940 feet (275 meters) through the rainforest and is 94 feet (30 meters) above the forest floor. Your guide will bring a bird spotting scope to use this superb vantage point for wildlife watching. There have been 587 bird species recorded around Sacha Lodge, which is 37% of all Ecuador’s bird species and makes the lodge a favorite option for birdwatchers. You can also inquire for specific birdwatching guides and birding itineraries. The Sacha Lodge itself provides two dining areas. One of these is positioned in the main lodge area and the other offers views of the beautiful Pilchicocha Lake. Your meals are served buffet style. On of your evenings, you will also enjoy a BBQ by the lake. 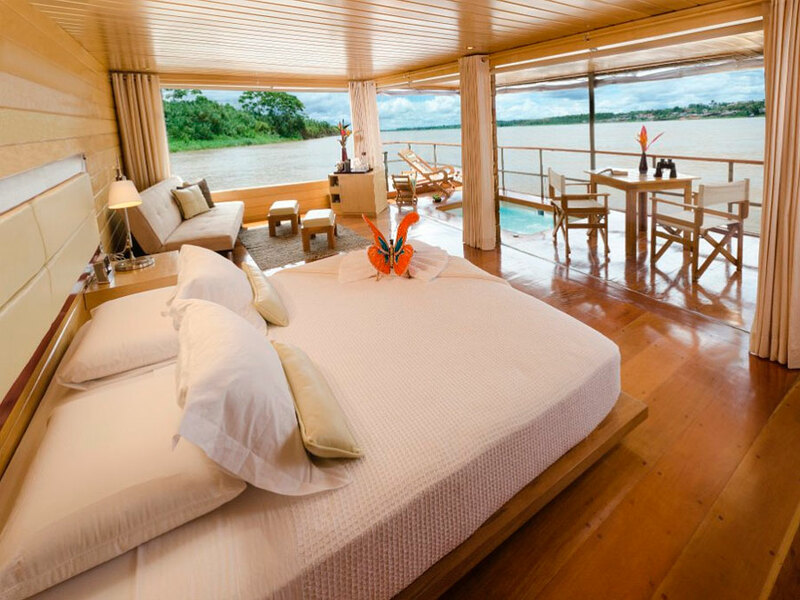 In addition to lodges, you can also explore Ecuador’s Amazon aboard a comfortable cruise. Enjoy a cruise down the Napo River and into the incredible Yasuni National Park. 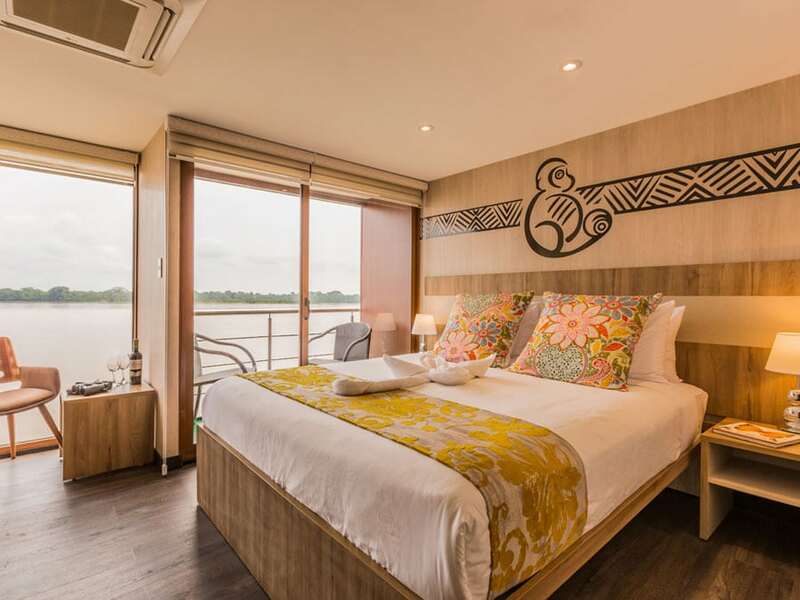 Providing a luxury cruise into Ecuador’s incredible Yasuni National Park, the Anakonda Cruise offers very comfortable accommodation, floor-to-ceiling windows throughout the vessel, delicious cuisine, and expertly guided wildlife tours from the main vessel. Explore the Amazon’s Napo River to find several different monkeys, pink river dolphins, caiman crocodilians, and a diversity of colorful birds. The Anakonda vessel offers 18 suites in total, including 4 Deluxe Suites with a private balcony. Enjoy comfortable, spacious accommodation, air-conditioning and modern en-suite bathrooms with hot water. In addition to accommodation, the Anakonda also provides a bar-salon, solarium, al fresco lounge, spa room and jacuzzi. The dining room is wrapped with windows offering fantastic views as you enjoy delicious cuisine. Aboard the Anakonda Cruise, choose from 4, 5, and 7 night cruise itineraries. Providing a comfortable cruise of Ecuador’s Amazon Rainforest, the Manatee Amazon Cruise offers a comfortable suite and expertly guided rainforest excursions. As you travel deep into Amazonia, you will leave the main vessel aboard motorized skiffs with a rainforest guide to find many different animals and plants. You will likely encounter macaw parrots and toucans flying over the trees, pink river dolphins in the waterways, and several different monkeys moving through the rainforest. In addition to different animals, you will pass tall emergent trees with delicate orchids and bromeliads perched on branches. In addition to excellent rainforest tours through the rainforest, you will also visit the Yasuni Claylick. This is a great place to see many colorful parrots visiting and feeding from medicinal clay. From the Manatee vessel, enjoy skiff expeditions, canoe tours, night expeditions, forest walks, and a tall canopy tower. The Manatee vessel itself offers 14 comfortable cabins with double-twin and single-twin rooms. Each accommodation option offers air-conditioning and ensuite bathrooms with massage showers. For a different experience of tropical forest, you can enjoy Ecuador’s incredible cloud forest. The cloud forest is one of the world’s most species-rich areas. The cloud forest contains the world’s highest diversity of hummingbirds and orchids. 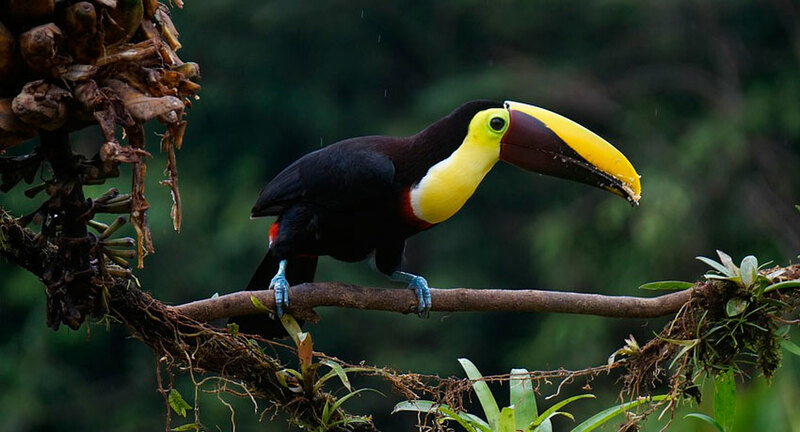 You can also find toucans, monkeys, many other colorful birds and fascinating plants, and even spectacled bears. The cloud forest offers a consistent daily temperature from 71 to 75°F (20 to 24°C). Rain can also be expected at all times of year from light drizzle to heavy downpours that can last for hours. From May to November, the coast is often overcast and cool. If you’re after a beach vacation, this is the best time of year to avoid on the mainland. However, between December to May is when the warm and sunny weather also brings with it the rainy season. It may seem strange to visitors from temperate countries that the best time of year for many places in the tropics can be the rainy season, but it’s the heat that drives the rain. Note that the rain often only falls towards late afternoon and evening then clears by the following morning. At higher altitude, the weather and temperature changes following a similar pattern to the cloud forest mentioned above. The city of Quito experiences relatively stable weather from month to month. However, as with other areas in the tropics, note that temperature at night can get quite cool and drops to around 50°F (10°C). June to September are then the driest months to visit Quito.